This image was created on the last afternoon of the Fort DeSoto IPT with the hand held Canon EF 300mm f/2.8L IS II USM lens and the Canon EOS 7D Mark II. ISO 400. Evaluative metering +2 stops off the pale water alone: 1/1600 sec. at f/2.8 in Manual mode. AWB. Click on the image to see a larger version. Center AF point/AI Servo-Expand/Shutter Button AF on the leading edge of the bird’s left wing as originally framed was active at the moment of exposure. Click on the image to see a larger version. Why Wide Open for Flight? 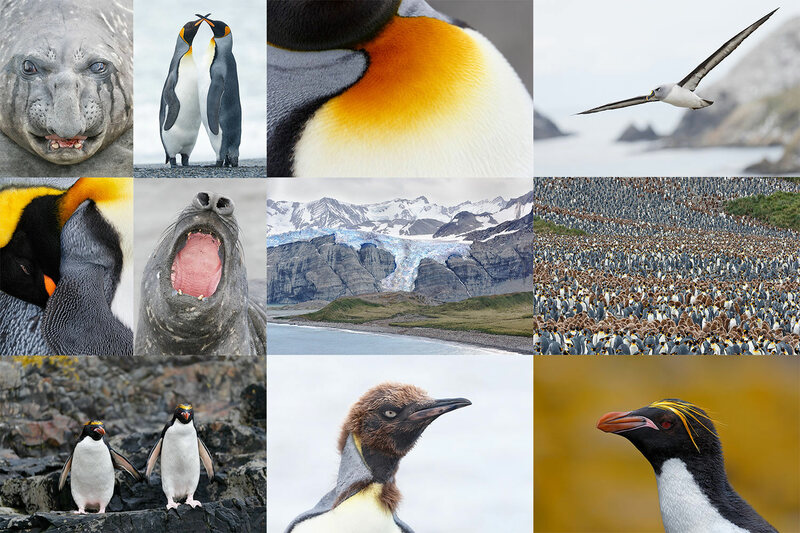 With most bird photography, the wide apertures are usually fine. They pay off with high shutter speeds and lower ISOs such as 1/1600 and ISO 400 here). With birds in flight, you almost always have enough depth-of-field to cover the bird from wingtip to wingtip, even when working at the wide open aperture. And if you do stop down, you do not gain much. You should stop down when photographing birds at extremely close range, close to the minimum focusing distance of your lens. In those case be to sure focus on the eye or at least on the same plane as the bird’s eye. Do click on this link and scroll down to read lots more on this exact topic. Multiple IPT veteran Carl Zanoni is offering a used Canon EF 70-200mm f/2.8L IS II USM lens in like new condition for the record low price of $1649.00. The sale includes front lens cover and rear lens cap, the ET-82 lens hood,the LZ 1324 Lens Bag, the tripod mount ring (collar), the original box, and insured shipping via UPS Ground to US addresses. Your item will not ship until your check clears unless other arrangements are made. Please contact Carl by e-mail or by phone at 860 306 9651 (eastern time). I have owned and used the 70-200 II since its release. It is an incredibly versatile lens. I use it (alone or with either the 1.4X III or the 2X III TCs) for both birds and for wildlife. It is a valuable tool at the gator rookeries. 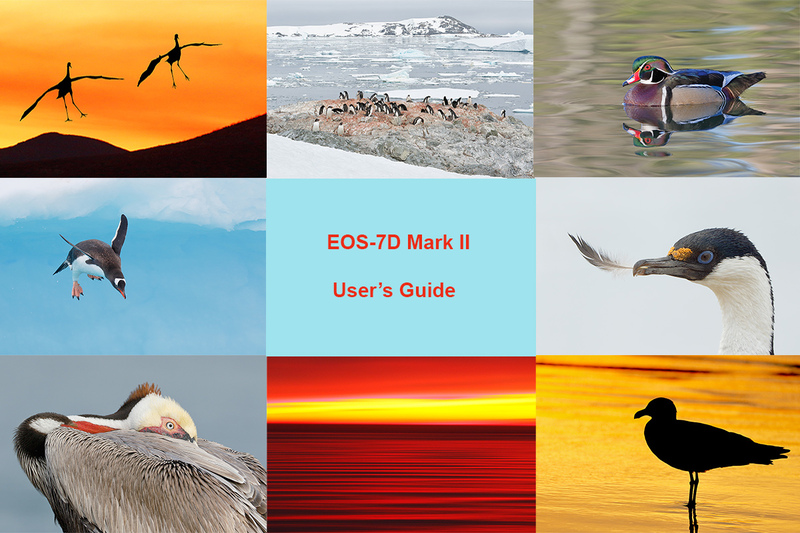 In addition, I use it for flower fields, flocks of birds in flight (especially geese at Bosque and skimmers at Nickerson Beach), for tree and scenic photography, and for pan blurs both hand held and on a tripod. And for tons more. As I said, “versatile.” Priced so low, the one should sell immediately. Multiple IPT veteran Carl Zanoni is also offering a used Canon EF 180mm f/3.5 USM macro lens in like new condition for $1175. The sale includes the E-72 II 72mm (front) lens cap, the (rear) lens dust cap E, the ET-78 II lens hood, Tripod Mount Ring B (tripod collar), the LZ1324 lens case, the original box, and insured shipping via UPS Ground to US addresses. Your item will not ship until your check clears unless other arrangements are made. I have owned and used the 180 macro for more than 10 years. It is the primo telephoto macro lens. It is sharp with and without a 1.4X TC. It offers a narrow field of view that goes a long way to eliminating back distracting background element. It is great for flowers and all sorts of bugs, butterflies, and dragonflies as well as for frogs and toads. Dave Bourgaize is offering a used Canon EF 24-70 f2.8L II USM lens in excellent condition for $1499.00. The sale includes front lens cover and rear lens cap, EW-88C lens hood, original Canon bag, and insured shipping via UPS Ground to US addresses. Your item will not ship until your check clears unless other arrangements are made. Please contact Dave by e-mail or by phone at (310) 748-9547 (pacific time zone). I own and use the 24-70II. It is much sharper edge to edge than the lighter, more versatile Canon EF 24-105mm f/4L IS USM lens. I consider the 24-70II a must for serious landscape photographers. As it sells new for $1899 Dave’s price is lower than any I have seen for this lens in excellent condition. It should sell immediately. Removing the two extraneous distractions (three-quarters of a Willet and a single feather of unknown origin) was easy using the repair techniques from APTATS I and II. I made a copy of the whole image, flipped it horizontally, added a Hide-All (Inverse or Black) Layer Mask, and covered the offending Willet after hitting BD. After flattening that layer I fine-tuned the area with several small Quick Masks that were in fact fine-tuned with a Regular Layer Mask. The single feather was covered with a small Quick Mask and again refined it with a Regular Layer Mask. That followed by my NIK 50-50 recipe and sharpening of the bird’s face only via a contrast mask. Please note that the animated GIF above represent a small crop of the full frame capture, from the top and the right while maintaining the original ratio. Everything that I did to optimize today’s image is covered in detail in my Digital Basics File–written in my easy-to-follow, easy-to-understand style. Are you tired of making your images look worse in Photoshop? Digital Basics File is an instructional PDF that is sent via e-mail. It includes my complete digital workflow, dozens of great Photoshop tips, details on using all of my image clean-up tools, the use of Contrast Masks, several different ways of expanding and filling in canvas, all of my time-saving Keyboard Shortcuts, Quick Masking, Layer Masking, and NIK Color Efex Pro basics, Contrast Masks, Digital Eye Doctor techniques, using Gaussian Blurs, Tim Grey Dodge and Burn, a variety of ways to make selections, how to create time-saving actions, the Surface Blur (background noise reduction) settings, and tons more. Learn the details of advanced Quick Masking techniques in APTATS I. Learn Advanced Layer Masking Techniques in APTATS II. Mention this blog post and apply a $5 discount to either with phone orders only. Buy both APTATS I and APTATS II and we will be glad to apply at $15 discount either with phone orders or here in the BAA Online Store. For phone orders, call Jim or Jennifer at 863-692-0906 weekdays. 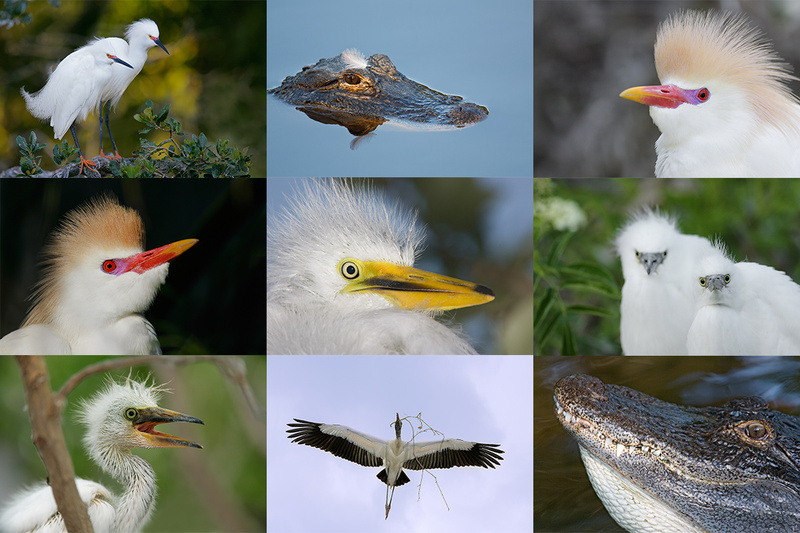 Clockwise from upper left to center: Snowy Egrets/breeding plumage pair, American Alligator with egret feather on head, Cattle Egret in breeding plumage (with fill flash), large Snowy Egret chicks, displaying gator, Wood Stork in flight carrying nesting material (fill flash), begging Snowy Egret chick, another Cattle Egret in breeding plumage (with fill flash), and Great Egret chick. St. Augustine Alligator Farm Short-Notice Spoonbill and Wading Bird Chicks IPT: May 4-6, 2015. TWO FULL and TWO 1/2 DAYS: $1099. Limit 8/Openings 5. Call me at 863-692-0906 Friday, Saturday, or Sunday for Late Registration Discount info. St. Augustine in early May is a bird photographer’s paradise. With any luck we should have chicks of all sizes in the nests ranging from newly hatched Snowy Egrets and Tricolored Herons to nearly fledged Great Egrets. More than a few pairs of Roseate Spoonbills have nested at the Alligator Farm for the past several years. 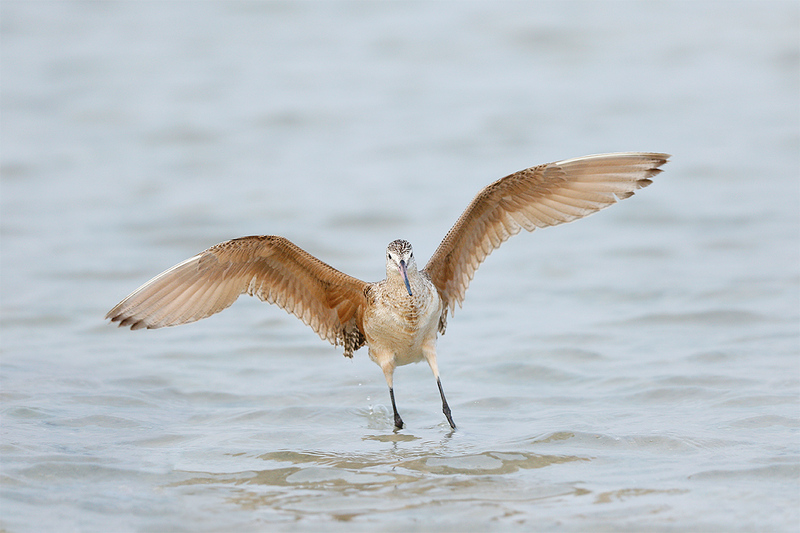 Photographing the spoonbill chicks in the nest is a huge challenge…. With any luck we will encounter a few Snowy and Cattle Egrets in stunning breeding plumage. We should have lots of flight photography ops especially late in the day. We will enjoy extra early entry on our three mornings. Folks who will need a photographer’s pass need to get us $89.95. This fee includes full season early entry and late stay and submission fees for up to 5 photos in their annual contest. This works out to cheaper than four separate entry tickets. We pick up the passes on our first afternoon. 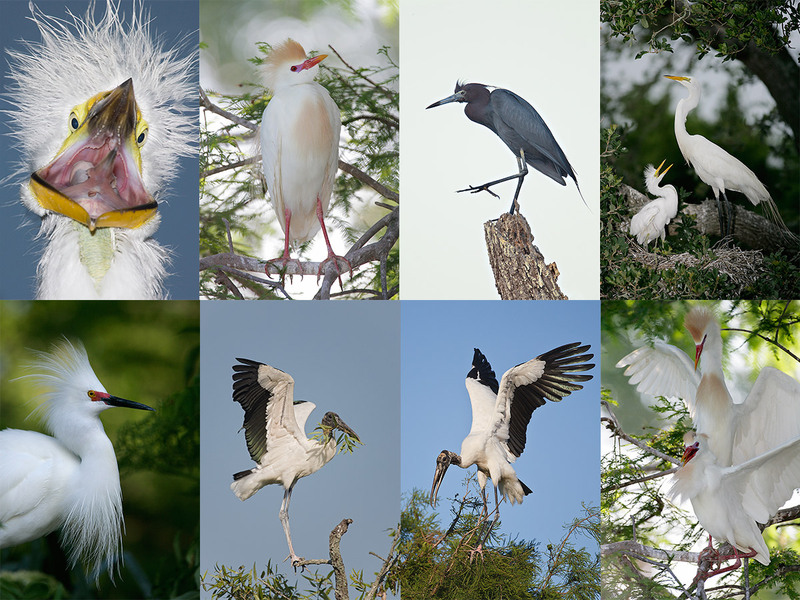 Clockwise from upper left: flash-as-main light Great Egret chick begging, breeding plumage Cattle Egret w/fill flash, Little Blue Heron, Great Egret chick in nest begging, Cattle Egrets copulating, Wood Stork with nesting material, another Wood Stork with nesting material, and breeding plumage Snowy Egret displaying. On this IPT you will the learn the basics and fine points of digital exposure and how to get the right exposure every time after making a single test exposure. You will learn to understand and predict bird behavior and to see and understand the light. You will learn to design pleasing images by mastering your camera’s AF system and how and why to work in Manual mode (even if you’re scared of it). Most importantly, you will learn to spot the good situations, to choose the best perspective. Rookeries are crowded, cluttered, white-washed places. Most folks who visit have no clue as to the difference of an image with tons of distractions and one with a clean line of sight and the best possible distant background. Join me and I will teach you to see like a pro. I will be bringing my flash to the Alligator Farm (gasp!) I have not used an external flash for at least a year. I will be teaching you how to use flash as fill and how to use flash as main light. In addition, I will be reviewing the flash flight techniques that I developed at St. Augustine more than a few years ago. 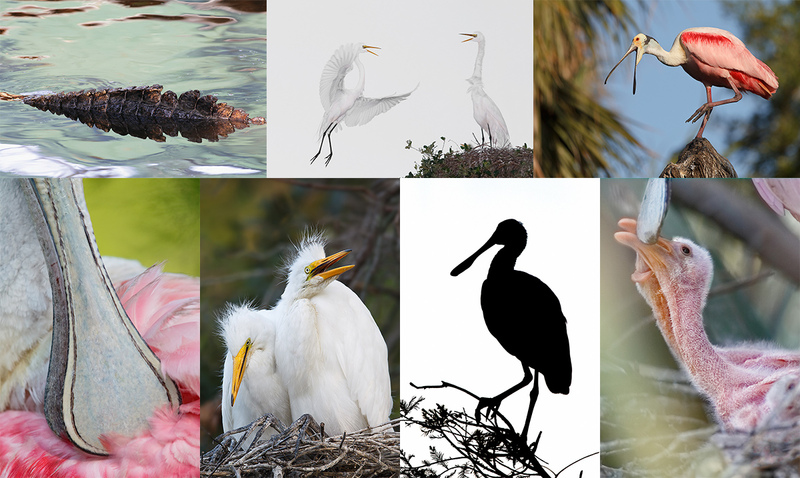 Clockwise from upper left: gator back, Great Egret returning to mate (with fill flash), Roseate Spoonbill with bill open, Roseate Spoonbill chick begging, Roseate Spoonbill 11am silhouette, large Great Egret chicks in nest, and bill of Roseate Spoonbill. Whats the Rest of the Deal? Afternoon session on Monday, May 4. Then two full days with a morning and afternoon session each day, May 5 & 6. Then our last morning on May 7. At lunch on Tuesday and Wednesday (both included) we will review my images; folks learn a ton watching me edit–why keep this one and delete that one? If you opt to bring your laptop, we can take a look at five of your best images from the morning or another session. We will process a few of my images in Photoshop after converting them in DPP. That followed by Instructor Nap Time. Payment in full is due now. Please click here to read our cancellation policy before committing. Then please print, read, and sign the necessary paperwork linked to here and get it to us. You can register by calling Jim or Jen at the office at 863-692-0906 and arranging for your deposit of $499. Balances are payable only by check. I hope to see you there. The Alligator Farm is quite good right now. Good spoonbill nests and lots of spoonbills. Also, Snowy Egrets, Tricolored Herons, and a few Cattle Egrets along with more than a few Great Egret nests with chicks. Hey Artie. Your assessment of the ‘Farm in early May is correct. May is definitely the most active time here. Just yesterday I noticed a nest containing 3, day-old spoonbills, and they should be able to stand up when you guys are here. There is also a newly constructed deck with a nice view of some 9 day olds and another nest that should hatch any day now. These two nests have favorable, distant backgrounds. Most BAA IPTs are sold out. There is room on my August Nickerson Beach Skimmer IPT, September’s Bear Catching Salmon IPT, and on both of the 2015 Bosque IPTs, each of those with two great leaders, Denise Ippolito and yours truly. See complete details by scrolling down here. To show your appreciation for my continuing efforts here, we ask, as always, that you use our the B&H and Amazon affiliate links on the right side of the blog for all of your purchases. B&H is recommended for you major photography gear purchases, Amazon for your household, entertainment, and general purpose stuff. Please remember: no phone orders: web orders only! Please check the availability of all photographic accessories in the BIRDS AS ART Online Store, especially the Mongoose M3.6 tripod heads, Gitzo tripods, Wimberley heads and plates, LensCoats and accessories, and the like. We sell only what I have used, have tested, and can depend on. We will not sell you junk. We know what you need to make creating great images easy and fun. And we are always glad to answer your gear questions via e-mail. Just got my 7DII and ordered your guide the same day. Great is all I can say. The info regarding the Canon auto focus system alone is worth the price…and then some.